Highly toxic and persistent chemical compounds contaminate the Columbia River Basin, traveling up the food chain and threatening the health of humans, fish and wildlife, according to a U.S. Environmental Protection Agency report released Thursday. The contaminants addressed in the survey include the pesticide DDT and the industrial chemical PCB, used as a coolant or lubricant in electrical equipment. Both "legacy toxics" have been banned in the United States since the 1970s. The EPA survey also focused on the presence of mercury, typically a byproduct of energy plants and other industrial sources outside the basin, and a more recent addition to the river environment, the chemical flame retardant PBDE, which is present in many products. "This is troubling news," said EPA Regional Administrator Elin Miller at a news conference unveiling its findings. "Tackling this problem will require a coordinated effort by all levels of government, tribes, interest groups and the public." Levels of DDT and PCBs have declined since the 1970s, and populations of bald eagles, ospreys and other species have rebounded over the past two decades as a result. But in some parts of the basin, Miller said, those compounds continue to pose an unacceptable risk. At the same time, the survey also found that concentrations of mercury and PBDEs were increasing in wildlife and fish. For example, it found nearly a fourfold increase in PBDEs in some fish species in the Spokane River between 1996 and 2005. 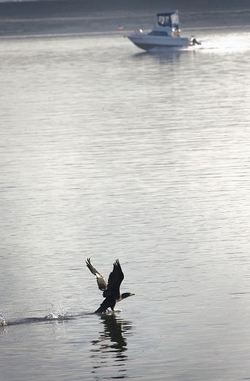 It also revealed that mercury levels had increased in osprey eggs in the Lower Columbia and in northern pikeminnows in the Willamette River over the past decade. An absence of toxins-monitoring data along some sections of the river made it difficult to determine whether toxins in the basin were increasing or decreasing over time, officials said. The presence of toxins in the Columbia is not news in Vancouver, where the closure of the Alcoa smelter in 2000 left behind a nasty stew of PCBs. Monitoring of the site in 2005 revealed high levels of the carcinogen - 3,500 parts per billion - in tiny Asian clams. The Washington Department of Ecology had known of the presence of high levels of PCBs in sediment on the site since 1997 but didn't order Alcoa to dredge and haul away the contaminated sediments until 2007. Upstream near Bonneville Dam, workers disposed of three electrical capacitors in 1969 by shoving them into the Columbia, contaminating the river with PCB-laden oil. It wasn't until 2007 that the U.S. Army Corps of Engineers undertook the cleanup of the resulting hot spots, which covered a little less than an acre of river bottom. Health authorities discovered crayfish in the contaminated mud with enough PCBs in their tissue to be disposed of as hazardous waste. Tribal members and others who eat a heavy diet of fish from the Columbia are at risk from ingesting unsafe levels of toxic contaminants, said Mary Lou Soscia of the EPA's Portland office. "We at EPA are very concerned about these special populations," she said. Some Northwest tribes have been pressuring environmental regulators to increase their assumptions about how much fish people eat on a daily basis. That would require regulators to do more to clamp down on toxic pollution discharges. Lauren Goldberg, staff attorney for the environmental group Columbia Riverkeeper, praised the EPA report as a call to action. "Columbia Riverkeeper has been advocating for tougher pollution controls for years," she said. "Toxic pollution is a serious problem throughout the Columbia basin. The EPA report demonstrates the failures of the past, but it's also a siren call to do more in the future." About 100 volunteers help the organization monitor water quality in the river, Goldberg said, but more attention to the problem is needed. Besides the four toxins surveyed, "there are myriad additional pollutants that impact people, fish and wildlife," she said. "We need our state and federal decision-makers to address issues including stormwater runoff to reduce toxic pollution." Cleanup of the Portland Harbor, Hanford nuclear reservation and Lake Roosevelt contamination sites. Erosion control in the Yakima Basin to reduce pesticide runoff. A collaborative effort to reduce pesticide contamination in the Hood River and Walla Walla basins.